You might have heard the terms Cuvée Prestige or Tête de Cuvée before. A non-literal translation of Tête de Cuvée would be "the head of the class" (a more technical explanation follows in this story). In any case, these precious bottles are nothing less than the best of the best the Champagne region of France can produce. They also symbolize the ultimate in luxury, something reserved for kings, czars, British secret service agents and captains of industry. As much as this is true, you, too, can partake in these luxurious offerings. Champagne has its very own mythology — it's the ultimate, the best, the most festive — and many people don't even associate it with wine. It's Champagne, the golden bubbles from the Champagne region of France. Affordability dictates that not all that sparkles in wine bottles will be Champagne from France. Indeed, 90 percent will be sparkling wines produced in America or elsewhere. And of the 10 percent that is labeled Champagne, only 10 percent to 15 percent each year are deluxe Champagnes, the best a house knows how to make. 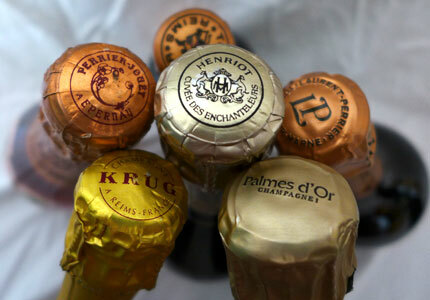 Each of the great Champagne houses of France makes a prestige cuvée or (cuvée spéciale), such as Moët's Dom Pérignon, Roederer's Cristal, Perrier Jouët's Flower Bottle, Taittinger's Comtes de Champagne and Veuve Clicquot's La Grande Dame. 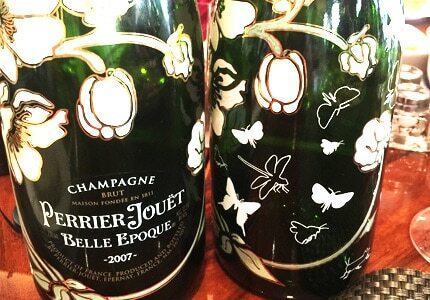 What is so special about these super Champagnes in fancy bottles with high prices? First of all, there is nothing else out there in the sparkling wine category that approaches their level of quality. And secondly, there are few products anywhere that have a richer image. We can thank James Bond for some of that. He can be credited with increasing the public's awareness of prestige Champagne as well as building their ne plus ultra image. In the novels by Ian Fleming, Bond's bubbly was invariably Dom Pérignon or Bollinger RD or Veuve Clicquot, usually consumed in the company of an appreciative woman. It was one of the secret agent's trademarks. In the 007 film "Casino Royale," Bollinger is featured. 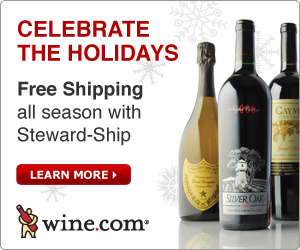 As advertisers, waiters and wine merchants know well, these deluxe wines appeal to our quest for the best. They make a statement about our lifestyle, our self-esteem, our esteem for others, our sophistication and, of course, our pocketbook. The two prestige cuvée Champagnes first created still dominate the market today, and they have become quintessential emblems in the popular consciousness of the elegance, joie de vivre, quality, mystery, and even romance that Champagne has come to express. Surely it is no surprise that they are Moët's Dom Pérignon and Roederer's Cristal. The House of Roederer created Cristal in 1878 for the Imperial Court of Russia and Czar Alexander II. The special cuvée took its name from the unusual clear crystal bottle that the czar insisted upon. Some say he did this because he was anxious that his courtiers should not doubt they were drinking a special wine not commercially available, while others suggest less charitably that he wanted to insure his health and safety by being able to discretely check on the bottle's contents. It was not until the early 1920s that limited bottles of Cristal were put on the market in France. Moët & Chandon is by far the largest Champagne producer, and far more Dom Pérignon is produced than any other deluxe Champagne. Nevertheless, DP (as it is sometimes called) or Dom is only a tiny percentage of Moët's total production. The wine was first marketed in 1928, exclusively in England and the United States, and was only made available in France in the 1940s. Virtually all of the grand Champagne houses have long produced special cuvées for their own private use, but Dom Pérignon's success inspired these houses to expand production and introduce these wines commercially in the 1960s and 1970s. These Champagne producers helped build the exclusive image of these wines by packaging them in special bottles, often replicas of eighteenth-century Champagne bottles and usually visually appealing bottles. It is not difficult to spot a bottle of prestige cuvée Champagne across a crowded room. But what's in the bottle that makes it so special? First of all, the grapes. There are 250 separate villages in Champagne, and the quality of the grapes harvested in each vineyard varies. Since 1911 (with periodic revisions), the villages have been rated and, today, scale from 80 percent to 100 percent. There are a dozen 100 percent villages, or grands crus, and the grapes from these villages have the highest quality and are the most expensive. About 40 villages are rated between 90 percent and 99 percent and are called premiers crus. The great majority of villages are rated at about 85 percent. The grapes that go into prestige cuvée Champagnes are almost exclusively from 100 percent villages and never come from lower than the top level of the premiers crus. Although the Champagne region is planted with 42 percent Pinot Meunier, 33 percent Pinot Noir and 25 percent Chardonnay vines, and each is integral in the blend of nonvintage Champagnes, the rapidly maturing Pinot Meunier is usually eliminated from the deluxe wines. Chardonnay provides the wine with elegance and lightness, and the long-maturing Pinot Noir gives it body and structure or what the French call La Charpente. Several of the prestige cuvée wines are blanc de blancs, made, of course, from only Chardonnay grapes, and a few are rosé Champagnes, generally made by adding a small percentage of still red wine to the blend. When describing prestige cuvées, it is difficult to speak in absolutes because there are no laws specifically governing their production. Champagne is the most regulated and strictly controlled wine produced in the world, and the rigid controls for vintage and nonvintage Champagnes are upheld for prestige cuvées (which are almost exclusively vintage Champagnes to start with, meaning they are only produced in years when the grapes are of excellent quality). For the prestige cuvée Champagnes, houses apply even more rigorous standards in pursuit of even greater excellence. When the grapes are pressed in Champagne, the law permits only three pressings, from 4,000 kilograms of grapes, with a maximum yield of 2,000 liters of grape juice from the first pressing (known as the cuvée) and 333 liters each in the second and third pressings. Only the superior juice from the first pressing is used in prestige Champagnes, and usually only the juice from the first one-third of this pressing is used. That initial and highest-quality juice is known as tête de cuvée (head of the cuvée) and has become synonymous with these wines. 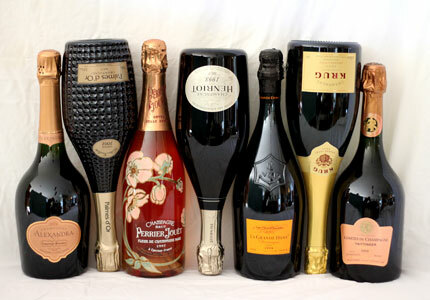 All of the prestige cuvées are brut with a minimum amount of sugar added. The small dosage is possible thanks to the quality of the grapes and the long aging process. All are produced in limited quantities and most only in vintage years, which in Champagne may mean only four or five times in a decade. 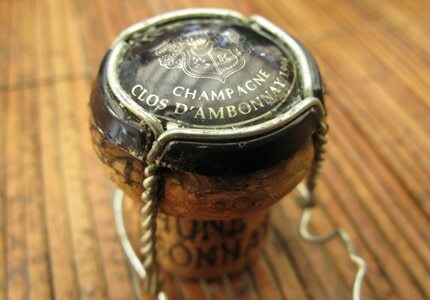 The period of aging for prestige cuvée Champagnes further distinguish them from other sparkling wines. By law, a nonvintage wine must be aged at least one year and vintage wines at least three years, though in practice both are regularly aged longer at the finer houses. For deluxe Champagnes, four or five years of aging before dégorgement is common and seven or eight years isn't exceptional. This prolonged aging can add not only to the quality of the wine, but also to the cost of producing it. There is a remarkable diversity of individuality among prestige cuvée Champagnes. They range in style from the light blanc de blanc of Taittinger's Comtes de Champagne to the full-bodied wines with high percentage of Pinot Noir in their such as Krug's Grande Cuvée. Additionally, because most are vintage wines, they take on characteristics of an individual vintage and differ from previous bottlings. Perhaps the most frequently asked question about these super Champagnes is: are they worth the price? For some, cost is part of their appeal. The high prices are justified if you can taste and appreciate the difference between a nonvintage and prestige cuvée Champagne. Many discriminating people can and therefore believe that paying the premium can be worthwhile. The prestige bottles, however, are not two or three times better than the nonvintage, though their price is usually double or triple the nonvintage. It is like everything else for sale: if you want the best, you have to pay a price for each increment in quality. If this might serve as a consolation, all things considered, the best of the best of Champagnes are still an outstanding value. Try comparing them to the best of the best of Burgundy, Bordeaux or even Napa. This alone might turn you into a disciple of this order and steer you to drink more Champagne year-round, and possibly push you to try a cuvée prestige now and again. If you've read this entire piece, you certainly deserve it!